Well I haven't been doing much 'digging for my dinner', but I have certainly been busy foraging. One of the obvious ways to use pesto is by coating pasta. For this recipe, I had a mound of Maris Piper potatoes growing little eyes and ears, instead of lobbing them in the compost bin, I removed the unsightly additions, peeled the potatoes, washed, boiled and mashed them to serve as a base - a bit like a pizza base, except this one is made from potatoes and then it was generously basted with homemade Wild Garlic Pesto, then topped with sliced the first of the British grown tomatoes. The Pesto Potato Crust was a little reminisce of Cranks Homity pies. Nevertheless this was a tasty and filling meal, but should I make it again it will require a little tweaking. 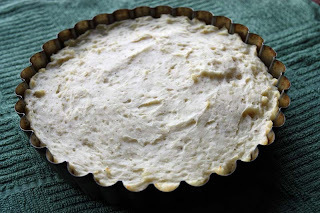 I'd make the potato crust in a larger tin (10 inch as opposed to 8 inch round) as the potato base was a little too dense. 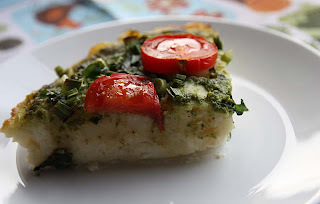 I'd also layer a little pesto between the mashed potato for taste and visual effect; or for ease just stir the pesto into the mashed potatoes so its well infused in flavour. Do you like my Grow Your Own Tea towel. My photograph is not doing much justice to it, but it depicts a dream of mine: a farmhouse surrounded with growing vegetables such as peas, tomatoes, carrots, pumpkins and strawberries, as well as chooks (hens). It comes from All Tea Towels. Okay for those of your interested in creating this recipe at home. Here goes. Boil the potatoes in their skins. 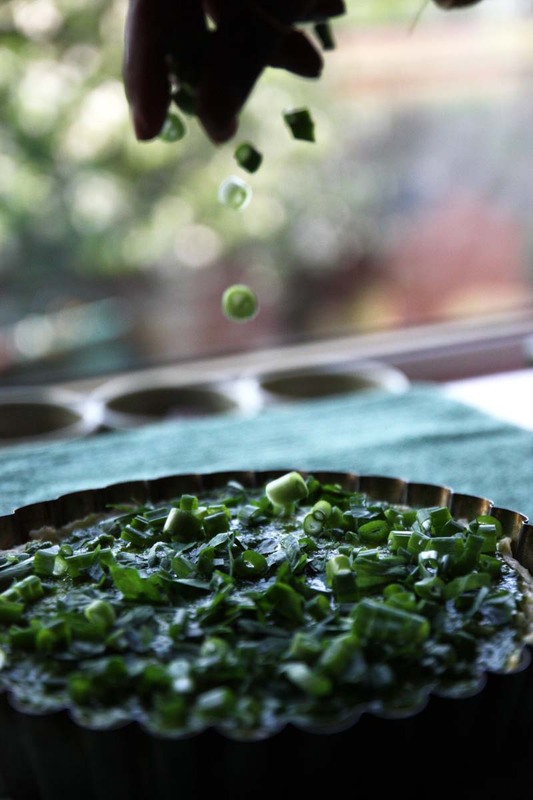 Drain, peel, mash and add the oil, egg and season to taste. Oil a 10 inch non stick flan tin and place on a baking tray. Increase the Gas mark to 6. Cover with the sliced tomatoes. Sprinkle with some Olive oil and season with salt and pepper. Bake for a further 20 minutes. 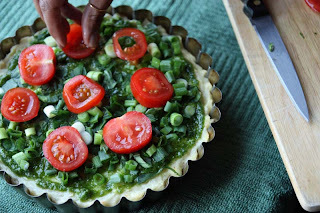 That looks amazing - and a great the pesto is a great for Wild Garlic. I'm really jealous, as I can't find any Wild Garlic anywhere near where I live! 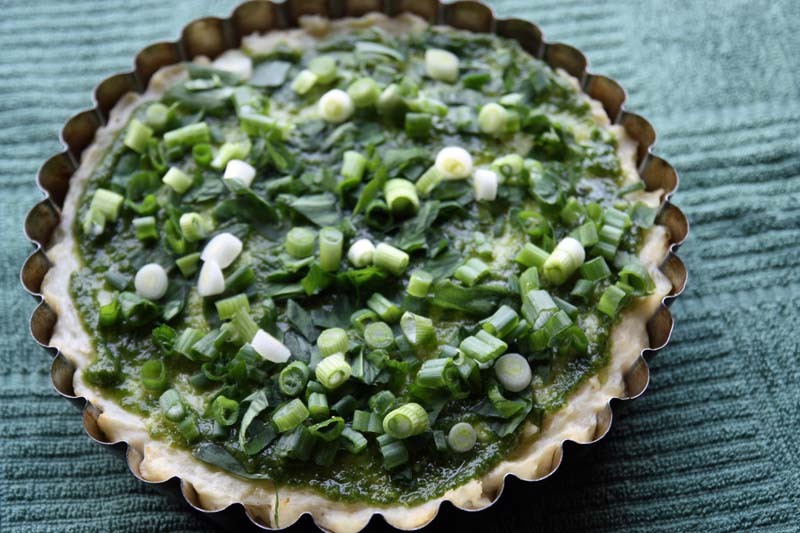 The recipes that you have made using wild garlic all look mouth watering! I don't think I've ever made a potato crust. This looks delicious! I think it will be a long time before you run out of Wild Garlic recipes! I do admire your inventiveness,it is inspirational! So much so, that I'm going to make some WG cheese straws and have them with a nice, mostly foraged or even begged from my sis (as my salad leaves are not big enough yet),salad and a chilled bottle of 'Old Speckled Hen' beer! Cheers! Such a gorgeous creation, pretty towel too. Oooh...we have the same tea towel, and once I get going we will be having the same Pesto Potato Crust.....it looks delicious I just HAVE to make it. Long time no hear. I've been visited your blog on and off, but no up-dates - so glad to hear from you again :) Hope all is well in your world. If I was in your shoes, yeph I'd be jealous to (HaHa). This year i have been spoiled with Wild Garlic. I am due to be leaving Scotland later this year so who knows whether I find some where I go! I am so pleased that you have enjoyed the recipes. I do sincerely hope you find some soon as the season is ending.. Thank you so much vegiebug. Its a bit trial and error, but its a nice change from the usual bready crust! I promise next month it will be a wild garlic free month. I am so pleased to read that you will be creating some WG cheesy straw nibbles. I can imagine it will go well with the 'your' salad and a chilled bottle of 'Old Speckled Hen' beer, though I'm a red wine kind of girl! It is a pretty towel. I do love Basil pesto though - I'm sure you will be writing about this later in the year! 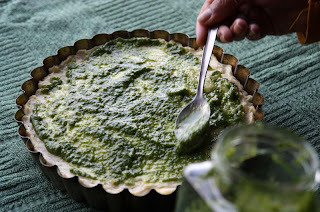 See what I did with the blog title :) Still wild garlic, but pesto is versatile and not everyone has been lucky like me with the wild garlic (wish you could see the smug look on my face - no not really, but felt I had to rub it in :), so any pesto will do. You may be surprised to note, that although I like the traditional basil pesto, its one I don't make, probably as I've never been able to grown basil well. Lovely... and Cranks homity pies.. i miss them! Hi There, This is looking absolutely delightful. Very nicely made and presented. Loved ur blog Title....! Have a great day ...Regards, Sonia !!! You do know that Waitrose sell Cranks Homity Pies. I saw some about six months ago, I didn't try them though, so can't vouch for their authenticity. I have just got to try that recipe - it looks deliecious. 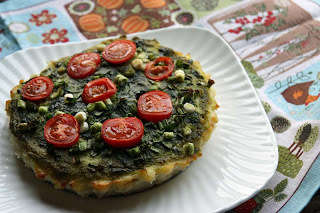 Your wild garlic recipes have benn really inspiring. 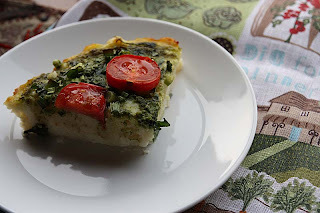 I did a post about wild garlic again this morning and added a link to your blog - hope that's ok! Thank you so much Vintage Jane. I've jsut got a couple more to share and then it will all be over until next year. It is so kind of you to link my blog from yours, its most appreciated and i always love to hear from other bloggers. Thank you. Hi there wild garlic ambassador! In truth, I'm a red wine girl too, but, the beer was a gift from a friend, so not to be wasted! Cheers! Me Wild Garlic Ambassador, now thats a real title! Thank you. If I was given a bottle of beer as a pressie, I too would be drinking it.